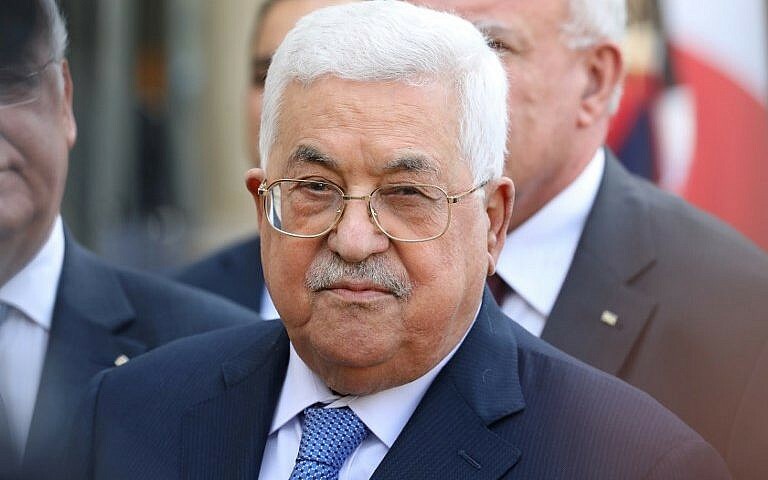 Palestinian Authority President Mahmoud Abbas said late Tuesday that the Ramallah-based Palestinian leadership is prepared to enter a peace process based on international law and United Nations Security Council and General Assembly resolutions, the official PA news site Wafa reported. Since shortly after US President Donald Trump recognized Jerusalem as Israel’s capital in December 2017 and initiated the relocation of the US embassy in the Jewish state to the city, Abbas declared the Palestinians will no longer work with an American-dominated peace process and called for the establishment of a multilateral mechanism for it. In the past year, he has invited a number of countries around the world to take part in a multilateral mechanism for the peace process. The last round of peace talks between Israel and the Palestinians, which were sponsored by the US, collapsed in May 2014. In late November, Saeb Erekat, the secretary-general of the Palestine Liberation Organization’s Executive Committee, said Abbas was willing to meet Netanyahu anywhere in the world. In early December, a PLO official, who requested anonymity, clarified that Erekat had meant to say Abbas was willing to meet Netanyahu anywhere other than Washington, DC. “We will not participate in a meeting sponsored by the Trump administration,” the official said in a phone call. Both Abbas and Netanyahu have frequently declared their readiness to meet, but have not held formal talks in several years. The last known encounter between Abbas and Netanyahu was at the funeral of former prime minister Shimon Peres in September 2016, where the two briefly exchanged pleasantries. The last time Abbas and Netanyahu met formally for negotiations was in September 2010 in Jerusalem. Many officials in Trump’s administration have said the US intends to publish a plan to resolve the Israeli-Palestinian conflict. Netanyahu has said he will look at the apparently forthcoming peace plan with an “open mind,” while Abbas has vowed not to consider any US proposal. In the past year, while protesting PA payments to terrorists, security prisoners and their families, and criticizing the operations and criteria of the UN’s Palestinian welfare agency UNRWA, the Trump administration has infuriated the Palestinians by recognizing Jerusalem as Israel’s capital, moving the US embassy in the Jewish state to Jerusalem, cutting hundreds of millions of dollars in aid to the Palestinians, and closing the PLO representative office in Washington. This entry was posted on December 26, 2018 at 4:41 PM and is filed under Uncategorized. You can subscribe via RSS 2.0 feed to this post's comments. You can skip to the end and leave a response. Pinging is currently not allowed.